Arthritis refers to joint disease or joint pain. There are actually over 100 different forms of arthritis, and arthritis is a symptom of other serious conditions, such as lupus, degenerative disc disease, osteoporosis, Lyme disease, and many others. Arthritis is also more common among persons suffering from diabetes, heart disease and obesity. Women suffer from arthritis more often than men. And, although arthritis also occurs more frequently among the older population, it certainly isn’t restricted to the elderly – persons of any age, gender and race can be afflicted with arthritis. Many people of working age suffer from arthritis and arthritis is one of the most common causes of long-term disability. Arthritis symptoms range from mild to severe. The most common symptoms of arthritis are pain, stiffness, swelling and a limited range of motion. Symptoms can be inconsistent and may worsen and even disappear for a time. For some people, symptoms remain consistent for years and then get worse as they age. Severe arthritis often results in chronic pain and a debilitating impact on a person’s ability to perform daily activities, including walking and climbing stairs. Arthritis can result in permanent joint changes, which includes visible changes such as knobby finger joints, but often, the symptoms of arthritis are not outwardly visible and can only be seen in an X-ray. As well as the joints, some forms of arthritis affect the organs, including the heart, kidneys, lungs, eyes and skin. For some types of arthritis, early detection and treatment can prevent permanent and degenerative damage. If you are suffering from joint symptoms for more than three days or have multiple episodes in a month, you should consult with your physician. Key symptoms to watch for include: pain, stiffness or swelling in a joint; tenderness or redness in a joint; or difficulty moving a joint or in performing regular activities. The most common type of arthritis is a form of degenerative arthritis called osteoarthritis. Osteoarthritis is caused when the cartilage wears away over time, causing bones to rub against one another, pain, stiffness and swelling. Osteoarthritis can result in a loss of strength in a person’s joints as well as ongoing pain. Factors that increase the risk of suffering from osteoarthritis include: a previous injury, age, family history and excess weight. For persons with severe osteoarthritis, these strategies may be somewhat helpful but sufferers may require joint replacement for significant relief of their symptoms. Most arthritis sufferers are of working age - arthritis is the most frequent cause of long-term work disability in Canada. About one in every six Canadians suffers from osteoarthritis, but that number is predicted to rise significantly within the next decade. Another common form of arthritis is rheumatoid arthritis. Rheumatoid arthritis can lead to permanent disability within ten years of onset if untreated or not properly treated. It’s not surprising that arthritis symptoms can easily interfere with a person’s ability to perform their job. Arthritis pain and reduced mobility can make it difficult, if not impossible, to sit or stand for long periods of time, and perform physically demanding work. In addition to reduced strength and mobility, the physical symptoms of chronic joint pain often result in fatigue, stress and depression. Metabolic changes and an increased level of inflammation due to arthritis pain are causal factors in depression among arthritis sufferers. And, depression is often accompanied by feelings of low self-esteem and self-loathing. This combination of physical and mental symptoms can impact the ability to perform almost any type of work, including office work involving sitting and working on a computer for extended periods, retail sales, and physically demanding work that requires heavy lifting and/or prolonged standing. Also problematic is the fact that arthritis flare-ups can be unpredictable and may interfere with the ability to perform key work functions at a job-critical time. Further, certain conditions within the workplace can increase the likelihood of a work disability due to arthritis. Workplace conditions that may lead to a higher incidence of long-term disability for arthritis sufferers include: high physical demands; a lack of, or minimal, controls over how duties are performed or the pace of work; and little or no support from co-workers. If you suffer from arthritis symptoms that interfere with your ability to work, you are likely eligible for long-term disability benefits under your disability insurance plan. An important requirement for eligibility is that you first seek medical treatment for your condition and follow your doctor’s prescribed treatment plan. If your symptoms continue to prevent you from performing the essential aspects of your job, you can apply for long-term disability benefits. Your application will include detailed information from your physician describing your symptoms and how they interfere with specific tasks you are required to perform at work. 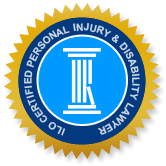 If your long-term disability benefits were unfairly denied, call an experienced long-term disability claims lawyer. At Injury Lawyers of Ontario, we have helped many Ontarians who are unable to work due to an injury or illness. Call us and find out how we can get you the benefits you deserve.